McLaren released its 2017 F1 car on the Friday ahead of the start of winter testing in a dual show both from Tokyo, Japan (livery release) and at their technology center in Woking, England. The car features interesting solutions applicable for the 2017 regulations, but as expected, still keeps a lot uncovered until the final test gets underway. The front wing appears to be a straightforward adaption of last year's to comply with the new regulations. It is as such wider and features a 12.5 degree backward angle. That doesn't need to be a surprise however, as most teams appear to have taken a very similar design route to previous years. 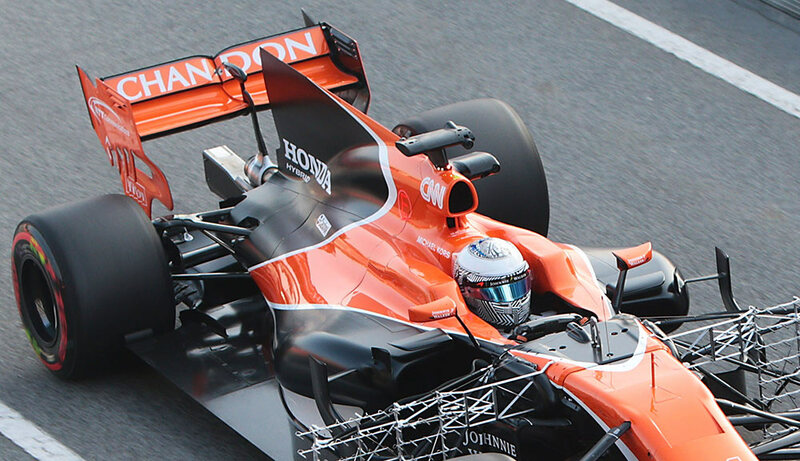 Towards the end of 2016, McLaren spent a lot of free practice time to test out a front wing with a flat leading edge across the wingspan, resulting in reduced outwash. It is still unclear if that wing was researching a completely different philosophy or just to simulate the wider 2017 tyres, but that trialled feature is not showing on the 2017 front wing, retaining a modest outwash tunnel. Taken over from last year, are the slots in the Y250 upper flap area. This is an area we see little change compared to last year as this is one of the few areas still receiving the same treatment as the flow underneath the nose remains vital for downforce production at the splitter and floor. This feature was however also copied on other 2017 cars, including the Toro Rosso STR12. The mounting pylons are a more extreme evolution from last year, having 3 slots at each pylon to allow more flow to get underneath the car. This solution makes the flow more turbulent, but just as last year the car features a fin underneath the cone to get the flow straight and laminar again. Just tucked in behind the nose pylon are inlets for the S-duct are present, again cleaning up the flow beneath the front crash structure. McLaren have chosen to retain largely the same front suspension layout as on this car's predecessor. With the wishbones positioned fairly horizontally, the car should have a reasonably optimal suspension layout, making it also very adaptable given the angle of the pushrod. The latter now attached to the monocoque even higher than before, requiring slight bulges in the bodywork to cover the rockers. Aerodynamically, the layout was slightly improved as well with the steering arm now packaged inside the fairing of the upper front wishbone, rather than sitting ahead of it as a separate arm. The uprights themselves also feature interesting brake ducts, which at the first test at Barcelona were already different from those present on the car at its launch in Woking. Two narrow inlets sit next to each other, one likely for brake cooling, and the other feeding the blown wheel hubs, which the team look set to continue to employ. Ahead of the sidepods, the barge board section is already reasonably complex. The general layout shows segregated surfaces. The supports connecting the bargeboards to chassis have been very carefully shaped to create a box-like inlet to shape and control the flow towards the sidepods. The sidepod turning vane is very much alike the Renault one, with a sort of s-shape in it. The sidepod inlets are still very small, leading up to a very curvy shape which extends to the car's maximum width before narrowing to the back. The pods are also heavily undercut, ultimately leaving a lot of floor surface exposed to airflow, maximizing downforce production at the diffuser. Clearly no big surprises here as McLaren follows its design logic of previous years. 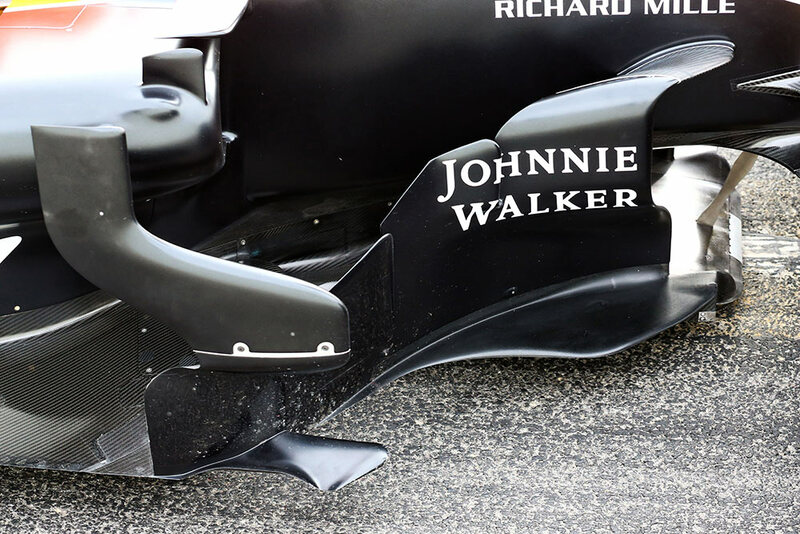 An area where McLaren does remain defiant is the airbox at the roll hoop, choosing for a very narrow inlet. Although disturbance from the airbox to the rear wing is a lot less since the latter got lowered, it can still help bringing that bit of extra downforce to the rear wing, as well as lowering the drag footprint. The design is either triggered by different turbo requirements or the result of fetching air from the sidepod instead. Since the roll hoop is structural (in this case as Sauber proved this is not always the case), this looks to be a definitive choice. Behind the rollhoop the car features a sharkfin, which is slightly cut out at its back to control the vortices rolling off from it. 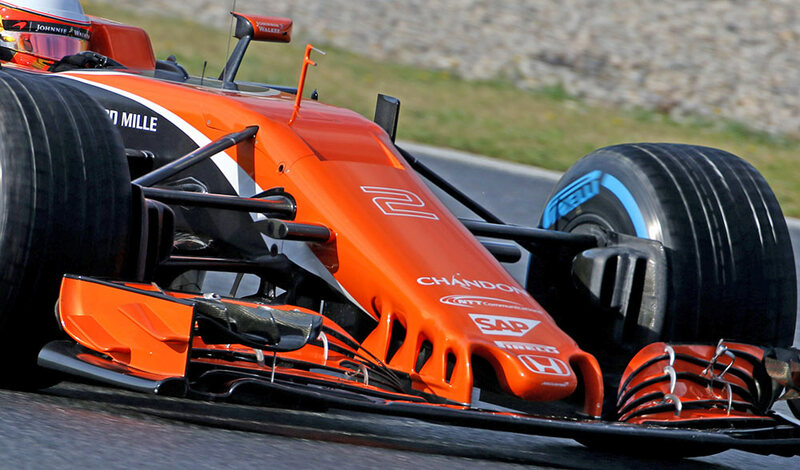 McLaren already noted they were going to test out a so called T-wing, as it now is clear all the teams have marked this area as a box without regulations. The support pillar for the rear wing shows a somewhat older solution where an Y-lon arcs over the exhaust and provides rigidity for the rear wing. The exceedingly used solution is to run the pylon right through the exhaust pipe which gives a packaging advantage with less blockage. However, that solution - introduced by Toro Rosso midway through 2016 - can come with drawbacks as the pylon inside the exhaust pipe is subjected to high temperatures which might cause uncontrollable flexing of the wing (or alternatively, controllable and deliberate flexing). Another issue is having an obstruction in the exhaust pipe causing a reduction in horsepower. 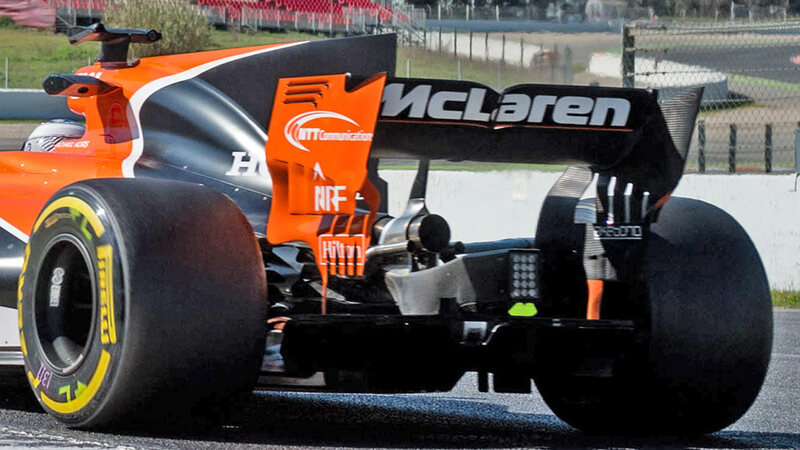 The pylon connects to the rear wing surface with an elegant swan neck on top, reducing blockage underneath the wing. Other teams choosing a similar setup directly connect the pylon to the DRS actuator pod, but in the case of McLaren the pod is higher up the wing, putting it out of reach for structural support. The most interesting parts at the rear are the endplate solutions. As one can see on the picture, the endplate has a large hole around where it twists inside, and is further complimented by strakes. It's unclear and puzzling with McLaren tries to achieve here, but it seems they want to get more flow between the endplates. Last year McLaren trialled a somewhat similar concept, but ultimately abandoned it. Either they feel this year's regulation allow the concept to work, or it was again in preparation for this year. Further testing continues on Tuesday at Barcelona, with the team certainly expecting increased reliability from its Honda power unit to be able to test the raft of (aerodynamic) upgrades they wish to evaluate.